To celebrate the launch of their New Spring Collection, Incoco is hosting this amazing giveaway! 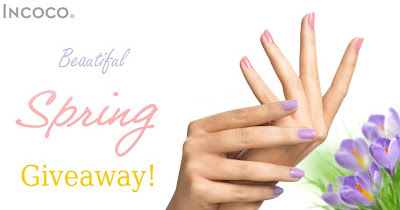 There will be 10 winners this time \o/ each winner will get one of the Color Manicure sets out of the ten colors from the Incoco Spring Collection 2012. All you have to do is fill out the form below. This giveaway ends May 17, 2012 at 1:00 p.m. Pacific Time, and it is open to all U.S. residents. To enter, begin by liking their Facebook Page, click here for the link. Then, browse the designs that they have on their website, and come up with something that is different, and that you would like to see. If you think one of their designs is already amazing, but you think it should come in another color, you can also mention that, there is no limit to whatever you'd like to write on question #3. Incoco strives to provide modern, state of the art Nail Appliques, and now they are all ears to hear your suggestions!